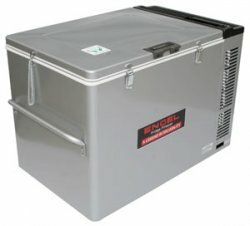 The Engel MT80 is our largest dual voltage freezer, capable of freezing almost anything. It is ideal for long term storage, particularly in remote areas. If used as a refrigerator, it can hold a steady interior temperature. It is a great product where size and volume matters. Operates off 12/24V DC or 110V AC. It automatically switches power from 12/24 volts DC to 110 volts AC. Inside Dims 20.1" x 14.9" x 16.7"
Outside Dims 31.1" x 19.3" x 21.7"
Power Leads DC - 5' detachable "pig tail"
Shipping Dims 36" x 24" x 26"
We run guided fishing trips from 1 to 7 days off of the Florida shores. Our staff and clients have really enjoyed the convenience of the new engel 12v dc refrigerator freezer. Not having to bring and maintain blocks of ice is quite a blessing. The performance is great and the power usage is so low that we don't notice it's running. A very nice addition to our small business. Frank R.
We couldn't have asked for a better piece of equipment. Your customer service is outstanding and the delivery time was a dream come true. From the bottom of my heart, Thank You. Jennifer G.
All fleet vehicles have been upgraded to accommodate this dc freezer. All seem to be functioning properly and they are working very well for our needs. Azeglio A. This has all of the cooling power and storage space we've been in need of. I still can't believe just how quiet it is during operation. Our small battery bank and solar array runs the dc refrigerator without complication.